Have you ever been engulfed in a story line of a TV show or a movie plot and unknowingly downed an entire container of popcorn or a bag of chips? 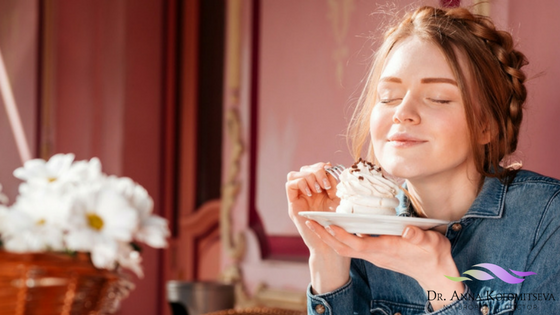 Mindlessly eating is a habit that is easy to fall into with the abundance of distractions all around us. When this happens, you disconnect with food and deprive yourself of enjoying every bite which inevitably leads to overeating. That is why it is so important to be present and practice mindfulness while eating and preparing your meals. You may ask, what is mindfulness? Mindfulness is a focused awareness of one’s own thoughts, actions and feelings. Mindfulness can also be applied to eating by focusing on feelings associated with hunger or by deliberately paying attention to the bodily and emotional sensations as food dissolves slowly in your mouth and by eating slowly while paying attention to that process. Interestingly enough, mindful eating was shown to be helpful for weight management and can be used in conjunction with a weight loss program that focuses on lifestyle changes, exercise, stress management, and living mindfully (1). Mindful eating was also shown to be a beneficial strategy for reducing impulsive food choices, which may prevent weight gain over time. A recent study by Hendrickson KL et al. has shown that participants with high percent body fat (PBF) have higher impulsivity for food as compared to those with low PBF (2). In addition, implementation of mindfulness-based interventions has been on the rise to treat obesity and various eating disorders. An instruction in mindfulness enhances the favorable sensory experience involved in tasting food as well as healthy eating patterns. Mindful eating lowers the consumption of unhealthy food and excess calories while increasing enjoyment of food (3). Pay attention to your senses as you bite and slowly chew your food. Enjoy food selection process by paying attention to the colors, textures, tastes and smells of fresh fruit, vegetables and minimally processed foods. Start your day with a protein-rich breakfast and eat about 5 smaller meals a day to keep hunger at bay and to prevent overindulgence. Involve your friends and family in preparations and enjoying meals together. Avoid engaging in emotionally charged conversations during meals. Turn off your electronics (phone, television, laptop, etc) while eating. Make sure you are sitting down for your meal and not standing or walking around. There is no need to slow down your life to cultivate mindful eating. You just need to create a peaceful setting that allows you to pay full attention to your meal. As with any new habit, mindful eating might take some time to develop but your waistline will thank you for it. Koithan M. Mind-Body Solutions for Obesity. The journal for nurse practitioners : JNP. 2009;5(7):536-537. Hendrickson KL, Rasmussen EB. Mindful Eating Reduces Impulsive Food Choice in Adolescents and Adults. Health Psychol. 2016 Nov 3. Arch JJ, Brown KW, Goodman RJ, Della Porta MD, Kiken LG, Tillman S. Enjoying food without caloric cost: The impact of brief mindfulness on laboratory eating outcomes. Behav Res Ther. 2016 Apr;79:23-34.